Kirino is Kyosuke's 14-year-old younger sister. She is mature for her age with a cold, tsundere-like personality. She has a strong "little sister" fetish and owns many adult games with older brother/little sister themes, relying on a modeling job to pay for them. Despite this, she states she does not know why she started liking it, though it is suggested that she has a brother complex and is using the games as a surrogate to this. She often denies such feelings and believes the 2D and 3D worlds should be kept separate. 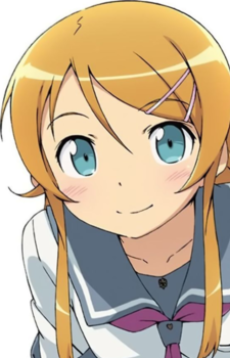 As a student, Kirino possesses a keen focus to studying and athletics. This attitude of hers when it comes to school activities has rewarded her with above-average marks, even as she enters the career of modeling. She developed a sort of perfectionist attitude due to becoming an overachiever, which eventually made her more prone to struggling when the odds are against her. When these moments come, however, she displays a more passive side. Upon her initial interactions with Kyousuke, she demonstrates an attitude similar to a "tsundere", with the bossy and abusive part more dominant. Although she maintains this attitude, she slowly tries to open up to her brother at times, reluctantly expressing gratitude on things that Kyousuke has done for her. Kirino reveals that she wishes to be the only girl in Kyousuke's heart, and thus does not want him to get a girlfriend. This was also the case with Kyousuke when Kirino gets a fake boyfriend to get to Kyousuke when he was dating Kuroneko. Eventually, the two agree not to date unless the other had a partner also.